FORMAT/INFO: A Dance of Blades is 407 pages divided over thirty-two numbered chapters and an epilogue. Narration is in the third person via several different point-of-views, both major and supporting characters, including the main protagonist Haern the Watcher, Alyssa Gemcroft, Veliana, Deathmask, Nathaniel Gemcroft, Arthur Hadfield, Oric, Ghost, etc. 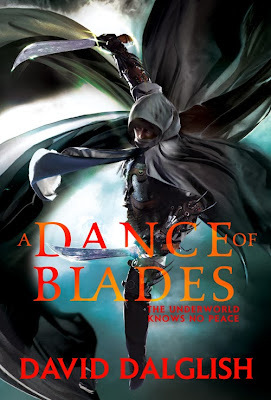 A Dance of Blades is self-contained, but is the second volume in the Shadowdance series after A Dance of Cloaks. November 5, 2013 marked the trade paperback and e-book publication of A Dance of Blades via Orbit Books. Cover illustration is provided by Michael Frost and Gene Mollica. ANALYSIS: As with my re-review of A Dance Of Cloaks, I'm attempting to do a similar thing with this one as this book has changed the least with only some minor text changes. I read this book more than two years ago and since then have absolutely loved this series. The story begins nearly five years since the events shown in “A Dance of Cloaks”. The city of Veldaren is slowly recovering from the catastrophic night in which the Guilds decided to remove the Trifect from the political equation. Unfortunately, things did not go as planned for Thren Felhorn because of the valor and dedication of a select few. Since then, the Guilds have fractured even further and now fight amongst themselves in an attempt to regain their earlier powers. The Trifect also suffers, but fares slightly better than their rivals. Complicating matters is a new addition to the city: the Watcher. The Watcher calls himself Haern, and is the son of the most famous and devious guildlord (a secret known to no one). Using his former training, Haern’s goal is to sow dissent among the Guilds. Meanwhile, Alyssa Gemcroft, one of the leaders of the Trifect, has successfully taken over the Gemcroft estate and now has a son, Nathaniel, from her dalliance in the previous book. Serving Alyssa as her protector is Zusa, the ex-forsaken of Karak and also a confidante to Veliana. Veliana’s mission to save the Ash guild was successful, but she is now subservient to the new Guild master. Readers are also introduced to Deathmask, a character from The Half Orcs series, while Lord Arthur Hadfield and Mark Tullen try to obtain Alyssa Gemcroft’s hand in marriage. Compared to A Dance of Cloaks, the prose in A Dance of Blades is remarkably more polished and a major highlight of the book. Pacing is similar to the first novel, meaning thrilling action sequences mingled with intriguing characters that reminded me of Paul S. Kemp and David Gemmell, but Dalglish has definitely turned up the excitement level. The story is more linear and streamlined than its predecessor, but there are still lots of machinations and subplots going on, while a deeper exploration of the world of Dezrel is provided. The grimness, which was so prevalent in the first book, has been toned down a bit, although plenty of killing can still be found in A Dance of Blades. Personally, I was glad for this as the author managed to surprise me a couple of times by killing off a certain character, while saving another. Thematically, salvation is a major theme, with many of the book’s characters seeking redemption, with both successful & unsuccessful results. Characterization remains top-notch giving readers a wide variety of characters to follow, including Haern with his psychological scars, Veliana with her toughness and never-say-die attitude, and Alyssa who now understands her father better than ever. What I love most about the characters is how they are all so unique and interesting, which is important in a book that features so many different POVs. Meanwhile, quite a few characters from The Half-Orcs series make an appearance in A Dance of Blades. With this book, there's a slight increase in the magic or paranormal nature of the world, of course in the previous book there were events and things happening that clarified that magic was present but with this volume, the author starts building it up even more starkly with the presence of Deathmask and his antics. Negatively, Haern’s abilities and vigilante actions reminded me of Batman, which made some things in the book easy to predict. Also, because the Shadowdance series is a prequel to The Half-Orcs series, and features many of the same characters, those who have already finished the Half Orc books know who will survive and who won’t. For me, this is the single biggest flaw in reading any prequel series, which is why I have purposefully held off from reading The Half-Orcs novels.